Artemis is the Greek Goddess of the Moon, hunting, child birth, Wilderness and Wild animals. She is the daughter of Zeus and Leto and her twin brother is Apollo. Artemis was a great hunter and hunted in the woods of Arcadia where she lived with her seven nymphs. Everyone was afraid of upsetting the Greek Godess so she lived alone with the company of just her seven nympths. A brave young mortal by the name of Orion was afraid of very little and he was in love with one of her nymphs named Merope. One day he was hunting in the woods when he saw Artemis's nympths he ran after them and they sprinted away quickly but Orion was just as fast. He reached out to grab Merope's tunic as she ran, but Artemis heard their cries for help and quickly transformed them into seven white doves. Artemis required Zeu's help to protect them and he quickly turned them into stars that people called the 'Pleiades'. Artemis then turned onto Orion but when she saw how brave, strong, beautiful and fast he was she was amazed. They quickly grew close to each other and became fast friends. They would challenge each other to foot racing, archery, hunting and storytelling. Apollo loved his sister and grew jealous of their friendship. Artemis told him that Orion is heroic when Apollo asked how she could love a meer mortal which angered the God. 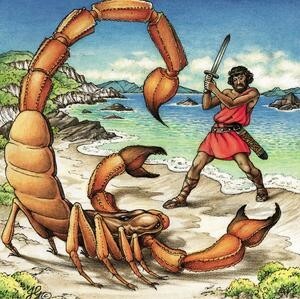 One Night when Orion was asleep he dreamed of a deadly giant scorpion which he could neither kill or even wound. When he awoke he was drenched in sweat and panicking. But when he realized that it was just a dream he he got up to go outside but there waiting for him was the deadly scorpion sent by Apollo. A deadly battle erupted and he fought viciously but just like in the dream he could not pierce the beast's armour. Eventually the scorpion backed Orion towards the sea and Orion jumped in and swam away. Artemis was lying on the shore when Apollo came and told her that an evil man by the name of Candaeon had attacked one of her forest priestesses and was swimming in the sea to escape from Artemis. Artemis was furious that someone had attacked one of her own and when Apollo told her that the distance figure floating in the water was actually Candaeon she immediately shot an arrow at it with perfect accuracy. Later on Orion's body washed up to the shore with her own arrow sticking out of his head and then Artemis realized her mistake. Artemis took him in her silver Moon chariot up to the sky and placed hime in the stars with his two loyal hounds and the Scorpion as an honor of their friendship.